“Previously” was a promotional release to radio in the late part of 1996, The purpose of the release was to remind people of the back catalog of U2 material and get people playing tracks in the lead up to the release of the new album “Pop” which was due in March of 1997. Two very different singles were produced under the “Previously” name. The second 5-inch CD was released in the USA. In the USA it was a seven track release and contained “Desire”, “Bad”, “Who’s Gonna Ride Your Wild Horses”, “Silver and Gold (Live)”, “I Still Haven’t Found What I’m Looking For”, “Mysterious Ways (The Perfecto Mix)” and “One”. It did not contain “Lemon”, and it also did not contain the album version of “Mysterious Ways”, both of which had appeared on the UK release. 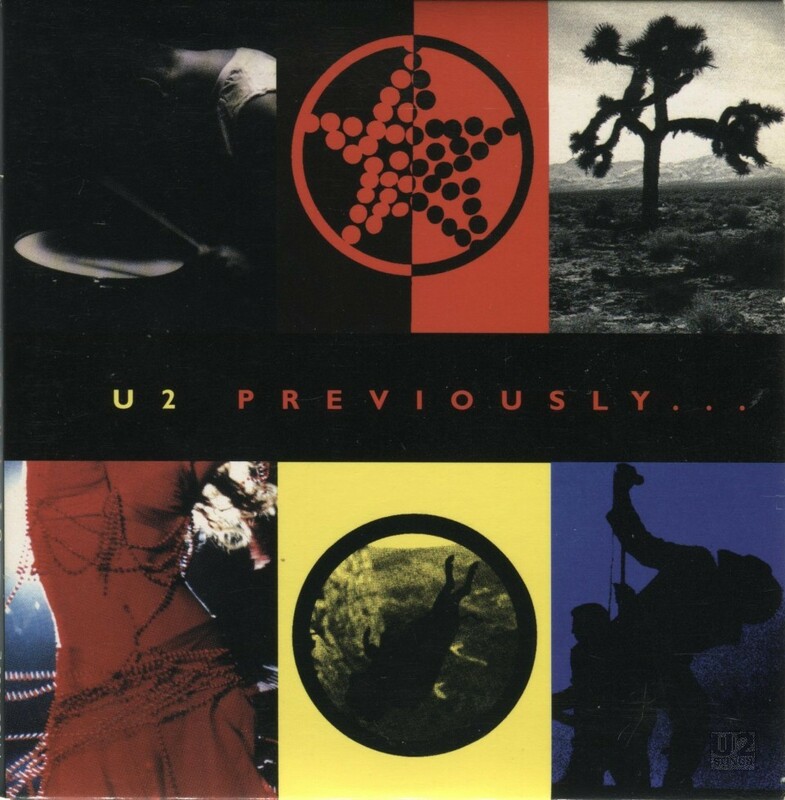 As “Lemon” was not part of this release, the location where the lemon had been on the UK cover in the bottom right corner, was replaced with an image of Bono in silhouette in blue. The CD for the US release was red, with black print, with the song titles being with no paint so the reflection of the CD shows through. In 1997 another CD was pressed titled the “WFM 96.9” promotional release. It was an exclusive for Mexico, and featured a similar cover to the UK release of “Previously” and also contained a similar track listing, with the addition of “Last Night on Earth”. Words by Bono. Music by U2. Produced by Flood, Brian Eno and the Edge. Written by U2. Produced by Daniel Lanois with Brian Eno. Engineered by Flood. Additional engineering by Robbie Adams. Assisted by Shannon Strong. Mixed by Flood, the Edge and Daniel Lanois. Assisted by Shannon Strong. Additional percussion by Daniel Lanois. Words by Bono. Music by U2. Produced by Daniel Lanois with Brian Eno. Engineered by Flood. Additional engineering by Robbie Adams. Assisted by Shannon Strong. Additional keyboards by Brian Eno. Additional guitar by Daniel Lanois. Written by U2. Produced by Jimmy Iovine. Recorded by Paul Barrett at STS Studios, Dublin. Mixed by Shelly Yakus. Written by U2. Produced by Steve Lillywhite, Daniel Lanois and Brian Eno. Recorded live by Thom Panunzio at McNichols Arena, Denver, Colorado, Nov. 8, 1987. Produced by Jimmy Iovine. Remixed by Paul Oakenfold and Steve Osbourne. Produced by Daniel Lanois with Brian Eno. Written by U2. Produced by Brian Eno, and Daniel Lanois.